California produces a variety of gemstones but is especially known for its tourmaline. 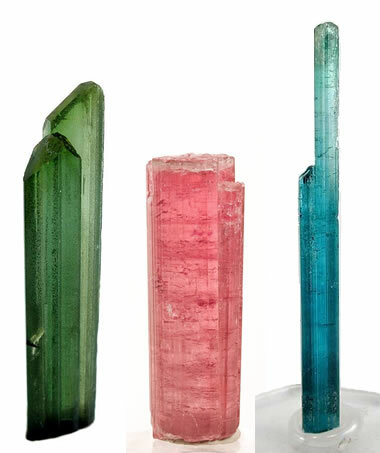 California Tourmalines: Three beautiful tourmaline crystals from pegmatites in southern California. The green elbaite is from the Little Three Mine near Ramona in San Diego County. It measures approximately 5.0 x 1.0 x 0.7 centimeters. The pink rubellite is from the Stewart Mine, Tourmaline Queen Mountain, in San Diego County. It measures approximately 3.9 x 1.4 x 1.2 centimeters. The blue indicolite is from the Maple Lode Mine near Aguanga in Riverside County. It measures approximately 5.7 x 0.5 x 0.4 centimeters. Specimens and photos by Arkenstone / www.iRocks.com. Native Americans were mining and searching for gem materials in many parts of California long before recorded history. Bone and shell were some of the first materials that they used. Bone was available from their food preparations. Shells were easily acquired at California beaches and from streams in many parts of the state. These materials were easily drilled to make pendants and necklaces. They were also easily sewn onto clothing. Over 1000 years ago, Native Americans learned to quarry soapstone on Santa Catalina Island and, using tools made from quartz and flint, fashioned it into ornaments, small sculptures, beads and utilitarian items. They transported these items back to the mainland in canoes and traded them across broad geographic areas. Then, at least 500 years ago, Native Americans began mining California turquoise. Archaeologists learned about their turquoise mining from tools found at ancient mining sites in San Bernardino County. Native Americans also searched for tourmaline and used pieces of the colorful mineral as ornaments. Native Americans were California’s first miners, first jewelers and first gemologists. California Gold in Snow White Quartz: Almost never seen in jewelry is a cabochon cut from a piece of the "California Mother Lode". A few lapidary artists have cut these novelty gems that are an especially fitting tribute to California's mineral heritage. 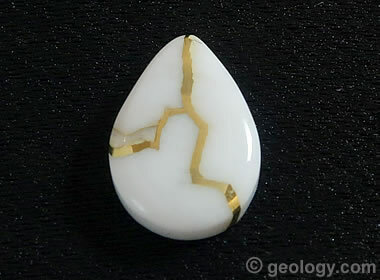 The example above is a piece of white vein quartz cut by a few thin veins of native gold. Earrings, rings and pendants made with these cabs are never seen in jewelry stores. On occasion you might find such jewelry and loose cabs in California rock shops and other stores that cater to gold prospectors, mineral collectors and goldbugs. The cabs are not cheap! They are often sold by the carat, but the buyer pays a price that often is calculated with the assumption that the entire gem consists of 24-karat gold - and then a premium is added on top. Why? Quartz with the properties and the gold to make a nice gold-in-quartz cab is really rare and worth its weight in gold. Perhaps it is the only gem where both karats and carats are used in the pricing! Tourmaline has been mined in California for over 100 years. On the basis of cumulative dollar value, it is the leading gem material that has been mined in the state. Commercial tourmaline mines began operating in the late 1800s. By the end of the century, a healthy mining and export industry had been established. California tourmalines occur in a wide variety of colors. The typical green and pink gems are produced in good quantity. Red and blue tourmalines are also found. Bicolor and tricolor crystals with lateral and concentric color zoning are also produced. Pink and green bicolor crystals are used to facet the popular “watermelon tourmalines.” California tourmalines are used to produce faceted gems, small carvings and cabochons. 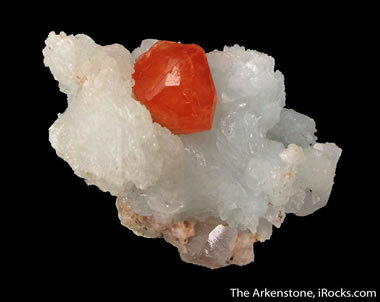 Some of the most attractive and perfect crystals are sold as mineral specimens. Specimen-grade tourmaline often sells for a higher price than facet-grade tourmaline. Benitoite - California's Official Gemstone: Benitoite is often cut into round brilliants because of its high refractive index and dispersion. Cutters must orient benitoite carefully to take full advantage of its pleochroism. Specimens and photo by TheGemTrader.com. California Mariposite: Mariposite is the name of a green and white metamorphic rock found in the Mother Lode country of California. It often contains enough gold that it is mined as an ore. Its presence was used by many "gold rush prospectors" as a sign that they were "close to the gold". Mariposite is an interesting material that is sometimes cut into cabochons or used to make tumbled stones. Some people think that it should be named the official "State Rock" or "State Gemstone" because of its distinctive appearance and association with California's gold history. Learn more about mariposite here. Benitoite can be easily separated from sapphire because it has a much higher birefringence and often exhibits birefringence blink. Crystals of benitoite are usually small and are rarely large enough to cut gems over three carats. The California Legislature named benitoite the "Official Gemstone of California" in 1985. Because of its rarity and high price, you are not going to find it for sale in the typical mall jewelry store. However, if you can afford the high price and are lucky, you might be able to purchase it in jewelry made by a designer who specializes in rare and expensive gems. Nice benitoite is especially prized by mineral collectors. They are usually willing to pay a lot more than folks who want to buy the crystals to cut faceted stones. They will not allow good crystals to be sawn and put to a faceting machine. California Spessartine Garnet: This specimen was found at the Little Three Mine, Ramona District, in San Diego County. The garnet crystal measures about 1 centimeter, and it rests on a base of albite which measures about 3.3 x 2.9 x 2.7 centimeters. Specimen and photo by Arkenstone / www.iRocks.com. Some of the highest-quality spessartine garnets in the world have been found in the pegmatites of San Diego County near the community of Ramona. Although very little is being found or mined today, Ramona spessartines are famous for their orangy yellow to yellowish orange color. Gem-quality and specimen-quality grossularite garnet has been found at several locations in California. Localities are in Siskiyou, El Dorado, Fresno, Tulare, Butte, and Orange Counties. The production of turquoise has a long history in California. Archaeologists learned about Native Americans mining turquoise from tools found at ancient mining sites in the area that is now San Bernardino County. Commercial miners have produced turquoise nodules and vein turquoise from deposits in San Bernardino, Imperial, and Inyo Counties. 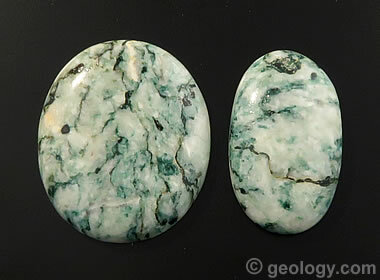 Today, very little turquoise is produced in California, and it is difficult to find California rough or finished cabochons - even if you search diligently for them. California Agates: You can find an enormous number of agates in California, each with its own distictive appearance, colors and properties. These two cabochons are plume agates. 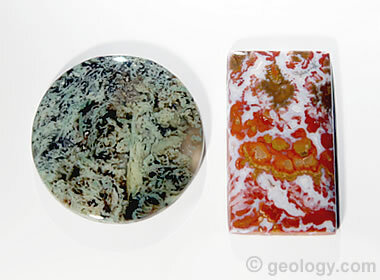 The one on the left is Horse Canyon Plume Agate and the one on the right is Wingate Plume Agate. California Petrified Wood: Lapidary-quality petrified wood has been found at many locations in California. 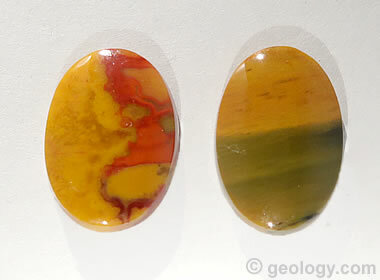 It is often colorful, sometimes shows nice wood grain, and often makes beautiful cabochons. For the last two centuries, millions of people have gone to California streams to pan for gold. They have very carefully searched through millions of tons of sediment. Perhaps it is not surprising that a few small diamonds were also found. The surprise is that remarkable numbers of diamonds have been found at a number of locations. Unfortunately, none of these locations had enough diamonds to support a commercial diamond mine, and a pipe that delivered these diamonds to the surface was never discovered. At one location in Butte County, north of Oroville, native gold, native platinum, and hundreds of gem-quality diamonds were recovered from Tertiary-age gravels of the Ione Formation. If you want to learn more and see a detailed map of where these diamonds were found, check out our article titled "Diamond Mines in the United States". It includes a section about diamonds found in California. California Vesuvianite: Vesuvianite is a complex silicate mineral also known as "idocrase". It is found in a few places in California where limestone has been subjected to contact metamorphism. It is usually brown, yellow or green. The green material can be especially attractive. When transparent and faceted it can look like peridot. When translucent and cut en cabochon it looks very much like jadeite. 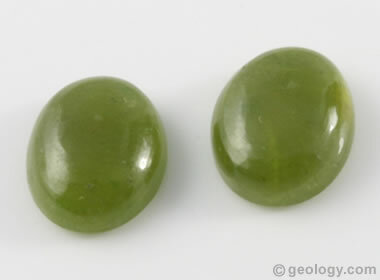 Vesuvianite is an exotic gem not often found in jewelry stores. California is an enormous state that spans a wide variety of geologic environments, many of which have the potential to be gem-forming. John Sinkankas, in his survey of North American gemstones, provides a large list of gems that have at least been found as an "occurrence" in California. Some of the most notable from that list include: andalusite, apatite, axinite, azurite, benitoite, beryl, calcite onyx, colemanite, cordierite, diamond, feldspar, fluorite, garnet, howlite, jade, lapis lazuli, lepidolite, magnesite, mariposite, obsidian, opal, quartz, rhodonite, orbicular rhyolite, serpentine, sphene, spodumene, steatite, thomsonite, topaz, tourmaline, turquoise, variscite, vesuvianite, and others. It's easy to get distracted by gems such as tourmaline, turquoise, benitoite, and diamonds, and overlook quartz. Anybody can find quartz of gem quality in California. Agates can be found in many streams and beaches. 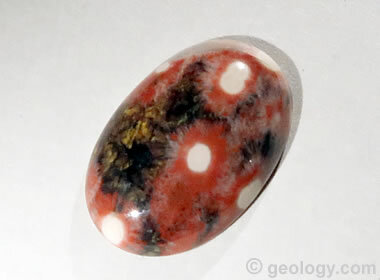 Jasper can be found in fields and in the desert. Petrified wood has been found in many locations and palm root at a few more. These gem materials are especially easy to find after a rain when the dust is washed off of the rocks and the gem material glistens from a thin coating of water. Facet-quality quartz can be found in a variety of colors. They are the perfect gem materials for a beginner, and you can polish them into beautiful tumbled stones using a rock tumbler for a small investment and a little practice. You might become a rockhound. California Petrified Palm Root: In addition to petrified wood, you can often find petrified roots as fossils. 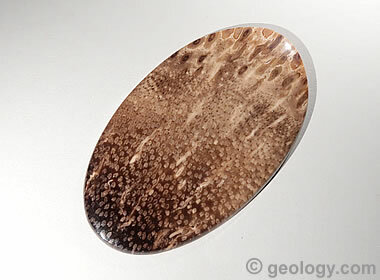 This cabochon was cut from petrified palm root found in California. It has a very interesting pattern that is a preservation of the root's cellular structure. California Morgan Hill Jasper: Just as there are many types of agates in California, there are many varieties of jasper. Morgan Hill is an extremely colorful and interesting jasper that is full of orbicular features, often with a concentric structure. Explore the Channel Islands: Native Americans and Steatite Trading, Article on the RAIN Public Internet Broadcasting Website, accessed March 2018. Turquoise, in An Overview of Production of Specific U.S. Gemstones, United States Bureau of Mines Special Publication 14-95, Published on the United States Geological Survey Website, accessed March 2018. Tourmaline, in An Overview of Production of Specific U.S. Gemstones, United States Bureau of Mines Special Publication 14-95, Published on the United States Geological Survey Website, accessed March 2018. Tourmaline History and Lore, in Tourmaline, GIA Gem Encyclopedia, Article published on the Gemological Institute of America Website, accessed March 2018. Secrets of the Gem Trade (second edition), by Richard W. Wise, Brunswick House Press, 385 pages, 2016. Spessartine Garnet from Ramona, San Diego County, California, by Brendan M. Laurs and Kimberly Knox; Gems & Gemology, Pages 278-285, Winter 2001.